Childcare services are in short supply across the country, but there’s one place where the government is actually rushing to offer free daycare for a select group of families: inside immigration detention centers. Last summer, the White House ran into a sticky problem when trying to detain refugee families who had crossed the border to flee mass violence. A court ruling had deemed the federal immigrant-detention system unsuitable for children because they could not receive decent care when caged in the compounds. 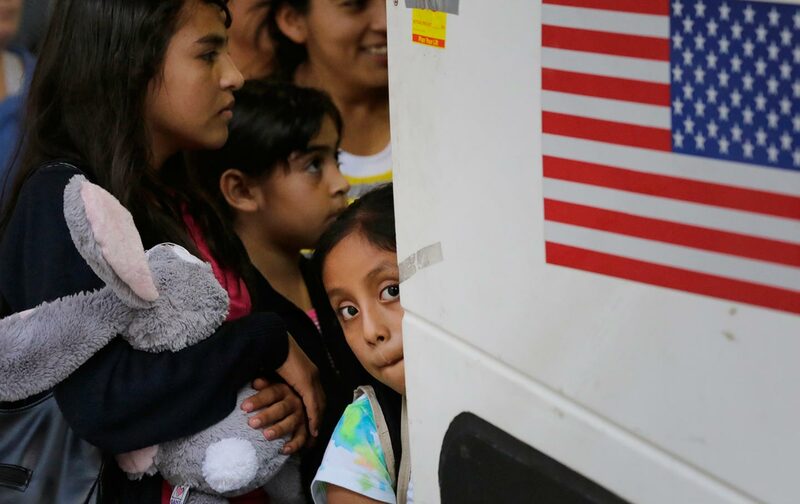 While court challenges have led the government to grudgingly free some families, the Department of Homeland Security has created a novel workaround for this conundrum for others, by turning detention centers into childcare centers. Rights advocates are not sold. For years they’ve decried family detention facilities as inhumane, unnecessarily restrictive, even unconstitutional—definitely no place for a child. While some families have have won release in recent months on a case-by-case basis, the administration has stiffly resisted legal challenges to its detention policies. Despite the fact that many thousands are migrating for humanitarian reasons, the White House has imposed an “aggressive deterrence strategy,” using punitive detention to discourage would-be migrants. The government is now claiming, ahead of an October 23 deadline for compliance with the ruling, that detention can double as daycare. In a letter to Texas Governor Greg Abbott and the state’s Family Services department, a coalition of civil-rights and social-service advocates argue that family detention centers, which have a capacity of over 3,000 altogether, would shunt children into “large, congregate care facilities” which are likely unable to meet children’s basic medical and social welfare needs. The groups also warned of safety risks, as the lack of oversight would leave young children vulnerable to physical or sexual abuse. To ease the licensing process for the prison contractors running the two largest family detention centers, Geo Group and Corrections Corporation of American (CCA), the Texas Department of Family Services issued a special “emergency” rule that eased some of the existing regulatory requirements for licensed childcare services, including a limitation of four children per bedroom. These “emergency” reforms, activists say, were railroaded through to bend the rules so that the government could be authorized to keep warehousing families in substandard conditions. Given all the harrowing stories that have emerged from detention centers—attempted suicide, hunger strikes, mental and physical health crises, and reports of child abuse—activists say already-traumatized families are needlessly locked up. Since the vast majority of those initially vetted have credible asylum claims, advocates instead seek less-restrictive alternatives, such as release to community-based supervision while pursuing asylum their claims. But the administration keeps pushing the rationale that treating migrants humanely would send the wrong message to Central American families—lest they get their hopes up that the government would honor their human right to sanctuary. This strategy fits well with the bottom line of the Obama administration’s partners in the detention business, Geo Group and CCA (neither company provided public comment when queried). With a designated capacity of 34,000 detainees, the companies have an economic interest in absorbing masses of immigrants, whether apprehended en masse at the border, plucked off the street, or simply caught up in the monstrously backlogged asylum courts. Past attempts to institute “family friendly” detention have collapsed. The basis of Judge Gee’s ruling is the 1997 case of Flores v. Meese, which essentially prohibited the detention of children for more than 72 hours. During the Bush administration, Texas’s short-lived Hutto Residential Center, a converted state prison, became notorious for subjecting children to inhumane, isolating conditions. After court challenges drove the facility to end family detention, the Obama administration effectively stopped the practice. But the recent border “surge,” which has brought more than 90,000 family members into the country since 2014, led DHS to haphazardly expand family detention to incarcerate mothers and children seeking asylum. This nation for us is our refuge and protection. We do not ask more than that and we urge you to end all detention. We must forge in our children healthy minds that are free from violence without having them go through the nightmare of being locked up for months. The government doesn’t need a special license to provide freedom for their children; it’s already covered under the Constitution.